Research papers on progeria discuss the terminal genetic disease that causes facial characteristics that make children with the condition look like they have aged prematurely. Progeria, which occurs in 1 out of as many as 8 million infants, is a terminal genetic disease that begins in the womb but typically does not show signs or symptoms until children with the condition reach the age of 18 to 24 months. Get help writing research on progeria and formulate your own research paper with the help of the medical health professionals at Paper Masters. What are the main medical problems faced by an individual with Progeria? Is there a difinitive cause for Progeria? Examine the statistics from the CDC regarding Progeria. What trends can you garner from the recent statistics? The formal name of the disease is Hutchinson-Gilford Progeria Syndrome, after the two English physicians who first identified and described the condition – Dr. Jonathan Hutchinson in 1886 and Dr. Hastings Gilford in 1897. Drs. Hutchinson and Gilford recognized that the disease not only changed the physical appearance of children with the condition but literally hastened the biological aging process in the children, which means that they experience the same loss of hair and body fat, joint stiffness, heart disease and risk for stroke that people as much as sixty years older than them suffer with. The prognosis for children born with progeria is not a very good one, with most not living beyond the age of 14 while others live as long as 21 years of age. There is no known cure for progeria however research has established that, while the condition is genetic, progeria cannot be passed on from a young mother with the disease to her child. 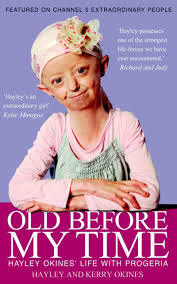 Women who have one child with progeria are at as much as a 3% greater risk of conceiving another child with the disease. Alopecia - Alopecia research papers discuss the autoimmune condition where a person loses hair from one or all parts of the body. Cardiovascular Disease research papers overview the disease that affect the heart or blood vessels. Paper Masters writes custom research papers on progeria and discuss the terminal genetic disease that causes facial characteristics that make children with the condition look like they have aged prematurely.